The story is a familiar one throughout America, as once-popular urban movie palaces lay empty and dilapidated for years — even decades, before eventually facing the fate of the wrecker’s ball. Built in 1940, Augusta, Georgia’s Miller Theater represented the state-of-the-art in cinema and vaudeville for more than four decades. Like so many others, an economic downturn in the ‘80s eventually shuttered the theater and it lay fallow. Today, however, following a $25 million, seven-year restoration project, the venue has finally reopened, with a mission to present a variety of productions. At the heart of the complex is the Brian J. Marks Hall, an Art Moderne masterpiece that seats nearly 1,300 patrons and offers exceptional sightlines from the front row to the back of the balcony. 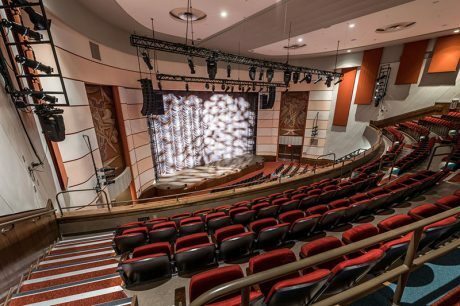 Chicago-based consultancy Kirkegaard Associates specified an L-Acoustics Kara system to complement the theater’s exquisitely restored visual aesthetic. The system was integrated by Mankin Media Systems of Franklin, TN. Added to those stipulations was the fact that decisions made during the renovations affected both the budget and the hall’s purpose — it went from being intended as the home of the Symphony Orchestra Augusta (SOA) to also accommodating a much wider array of performances, including concerts and theatrical productions. And that, says Chang, is where the L-Acoustics Kara system came in. 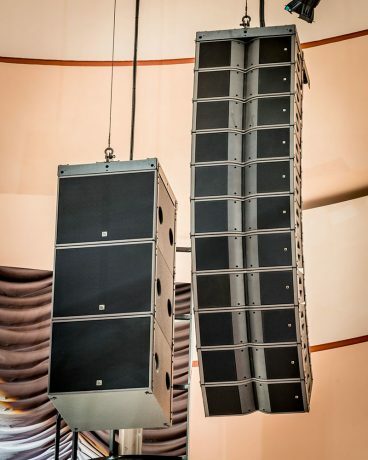 Kirkegaard designed a main house system comprised of left and right arrays of 11 Kara each, flanked by sub hangs of three SB18i per side, with eight compact 5XT coaxial speakers spread across the stage lip for front fill. Coaxial X Series speakers were chosen for the balcony and under-balcony areas, the under-balcony is covered by three X8 enclosures mounted just under the front edge of the under-balcony ceiling, with another row of three 5XT mounted from the ceiling about 20 feet further back for back-of-room coverage. Audio coverage for the balcony is supplemented using an array of three X12, and all systems are powered and processed by a total of 10 LA4X amplified controllers. The main P.A. consists of left/right hangs of 11 L-Acoustics Karas, flanked by sub hangs of three SB18i per side. The under-balcony experience is further enhanced by the input from a pair of microphones that Mankin Media Systems hung from the center of the hall and that are fed back into the delay speakers through the LA4X amplified controllers, providing authentic ambience to the tight space under the balcony. 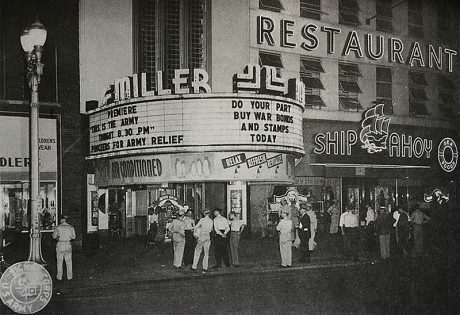 The Miller Theater – supporting the war effort in 1943. Frank J. Miller was an Augusta-based entrepreneur, running five downtown theaters, including the flagship Miller Theater, which he commissioned in 1938. When it opened with its original 1940 seating, the 1,600-capacity Miller was a stunning Art Moderne-style design decked out in Italian marble terrazzo and black walnut millwork, and was the second largest theater in the state. The Miller Theater eventually closed in 1984 and sat empty until 2005, when Augusta businessman/philanthropist Peter Knox IV purchased the property and began an intensive preservation project. 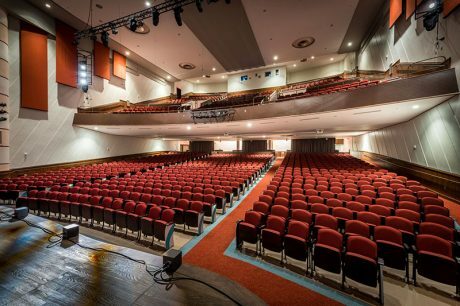 After installing a new roof, updating the ventilation system and removing water-damaged carpets and fixtures, Knox considered what would be best for the theater and community. In 2008, Mr. Knox offered the Miller Theater to Symphony Orchestra Augusta as a performing venue and the symphony’s board of directors accepted the offer. 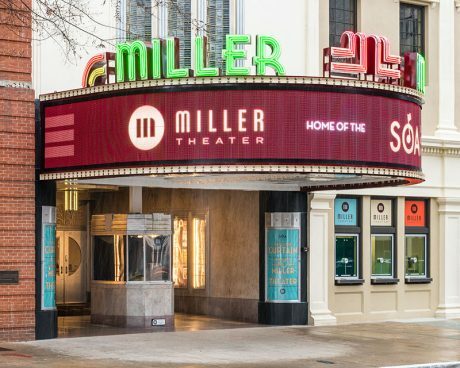 Eventually, a full-on, seven-year $25-million renovation project began which would bring the Miller Theater up to state of the art performance standards. The effort was designed not only to provide a permanent home for the symphony, but to preserve this vital and vibrant keystone of Augusta history and culture. And now, some 80 years after it was originally commissioned, the Miller Theater continues on as the pride of Augusta.